Имате въпрос към Nampo Comma Hotel? Ако това, което търсите е хотел с добро местоположение в Пусан, не се колебайте, а изберете Nampo Comma Hotel. Този 2-звезден хотел е леснодостъпен, тъй като е само на 10km от летището. С удобното си местоположение хотелът предлага лесен достъп до всички градски забележителности, които задължително трябва да се видят. Съоръженията и услугите предлагани в Nampo Comma Hotel гарантират Вашия приятен престой. Хотелът е оборудван със съоръжения като безплатен WiFi достъп във всички стаи, ежедневно почистване, магазин за смесени стоки, 24-часова рецепция, съхраняване на багаж. Влизайки в една от 28 уютни стаи, ще забравите за ежедневния стрес с помощта на удобства и съоръжения като телевизор с плосък екран, хидромасажна вана, климатик, отопление, бюро в някои от тях. Хотелът разполага с голямо разнообразие от развлекателни съоръжения като гореща вана, спа. Nampo Comma Hotel е добър избор за всички посетители на Пусан, защото предлага спокойствие и безпроблемен престой. The location is very very convenient, about 3 mins to Nampo metro station. Room is very clean and comfortable, light breakfast (toast, coffee, juice...) offered, only weakness is that little weird smell at first we get into the room. The boss is really really nice, even help us carry the luggage when we leave. Very recommended and will live here for next trip. good location, 5mins walking distance from Nampo MRT Station exit 7, friendly staff. When we go out in the raining day, the staff stop us and lent us the umbrella. This is my 3rd times stay here. Comford bed , warm room and stable water heater, everything is good. Located at the end of gwangbok road. near to the nampo subway station and various shopping such as lotte duty free, branded shop and roadside food stall and also convenient store.the hotel room is spacios and clean. The bathroom have rain shower and also handheld shower. Just that the door is semi transparent. The hotel provide daily 2 mineral water and 2 canned drinks with tea bags and 3 in 1 coffee. A coffee machine is located at the entrance (free of charge). overall i have a great stay at the hotel. Pro : location is a plus plus. Very Near subway station, Jagalchi fish market, BIFF, Yongdusan park, Nampo underground shopping and Lotte mall. Will be back 👍 Con : Taxi driver has difficulty locating the motel as the signage is fixed on 6th floor high. Once this motel is located, the con becomes history. Location is superb for this motel. Smack right in Nampo shopping street and walking distance to Jagalchi fish market, BIFF, Lotte Mall, Subway station and Yongdusan Park . 2nd time staying here. Free flow of coffee from the coffee dispenser. Con : Taxi driver has difficulty locating it. The hotel signage is placed at 6th floor high . so close to nampo metro exit no.5, very convenient for shoppoing and eating day and night. although hotel staff are not able to have good communication in english,but they will help to order fried chicken delivery👍 but bathroom door is transprant. it is good for couples but embrassed for friends. This is our second time stay this hotel.We really enjoyed our stay for 4 night at Nampo , easy reach and near to exit metro . big room and Housekeeping Everyday.Cosmetic shop & Restaurant you can find downstair along the street.No worry u get hungry most restaurant open early to midnight or 24 hours. I'm extremely satisfied with the location of this hotel. It's very close to downtown Busan and the subway station! The room is big and clean. The staff is so nice. My charger/adapter didn't work and they lent me their own charger! I enjoyed the free coffee too! Wifi speed is fast and there's a desktop computer in the room. For this price, I have absolutely no complaint and I would definitely come back. 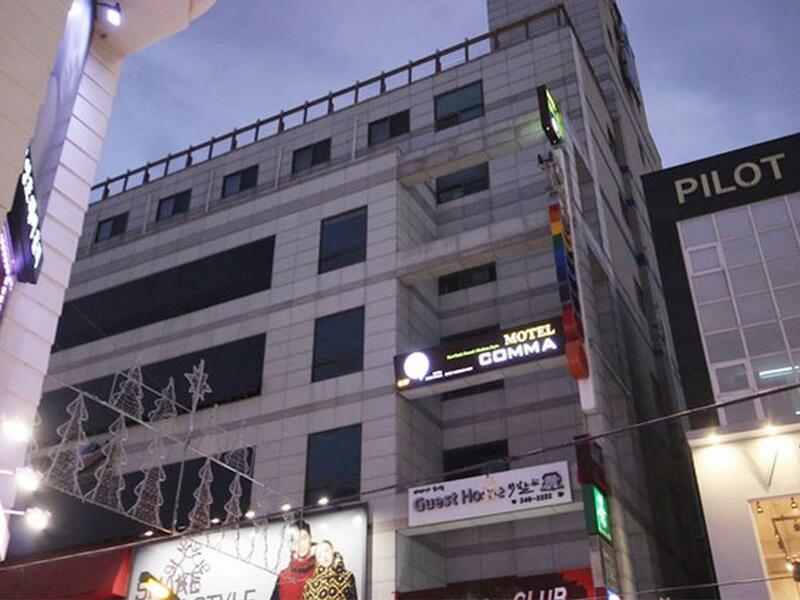 Location is good, near to nampo train station, lotte mart, gs25 and cosmetic shops. Staff is very helpful, they helped to order zhajiangmian delivery and booked the taxi to airport. There is coffee machine, so we had free coffee to drink. Cleanliness has to be improved, as we found some hairs on bed and also on the towel. The location is good, 2 minutes walking distance from the Nampo Station, and it is situated at the Gwangbok shopping street. 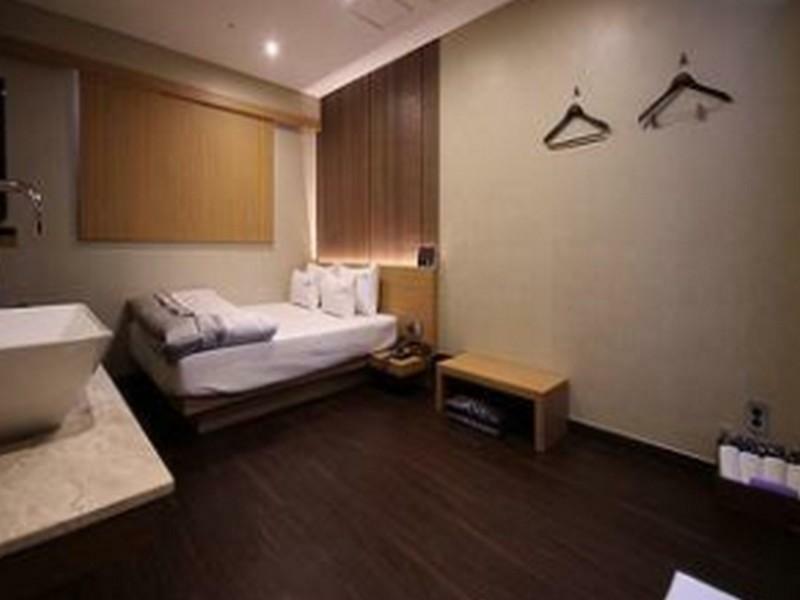 The room is spacious, comfortable and clean, however, the towels provided are small size. The staff are very friendly, we are lucky to got our room upgraded from standard to deluxe during our stay. Before check-in time, they also allowed us to take a short break at the other room (pending cleaning) so that we can charge our electronic devices. Breakfast is not included, however, there is a coffee machine near the check-in counter, it is free of charge. I would definitely to stay here for my next visit to Busan. The hotel surrounded alot of restaurant , shop , and bar. very convenient and value of money... just the toilet n basin cleanliness still acceptable and hope they will do something to maintain the toilet .3 min from Nampo Station exit 5. 3min to metro station, tons of restos n shops nearby, really convenient. The room is very spacious, though cleaning is not thorough. I stayed 4 nites, they just roughly cleaned the room from the 2nd day, didn't pick up the hair in shower, even forgot to change toilette paper... Finally, I booked this "Hotel" on agoda, but when I arrived, found it's actually a "Motel", though it's good value for money, I'd rather not staying in a motel. We arrived early at 10 a.m., so the staff let us put the luggage there and we were told to check-in at about 4 or 5 p.m. But when we came back to hotel at around 3:30 p.m, they said we couldn't check-in because the rooms were still in use. We needed to wait until 7 p.m. It was totally weird and unreasonable, since we've already reserved the room a month ago and paid on Agoda. The rooms should be reserved for us as scheduled. The staff did not explain the situation in detail, but right away said they could arrange another hotel for us - run by the same holder, just open, rooms fare more expensive with seaside view, its name called May hotel, on the 13th floor of a building. Because it was their mistake, we did not have to pay the extra fee. As we were tired and had no choice, we accepted and dragged our luggage for a few blocks to the new hotel. Fortunately the rooms in May hotel were very cozy, with new facility, large-size TV and computers, and the sea views were great. We were satisfied with the new rooms, but we still did not know what was the problem with Comma Hotel and whether the new hotel was really better than the original hotel as the staff said. Whatever the reason was, this kind of situation of being arranged to another hotel should be prevented. This hotel is location at the famous shopping street in Nampo Dong. Walking distance to major attractions like BIFF square, Jalgachi Market, Yongdusan Park. Also 3 minutes walking to Metro station and Underground shoppping street. The hotel is very clean and the size is just ample for two. 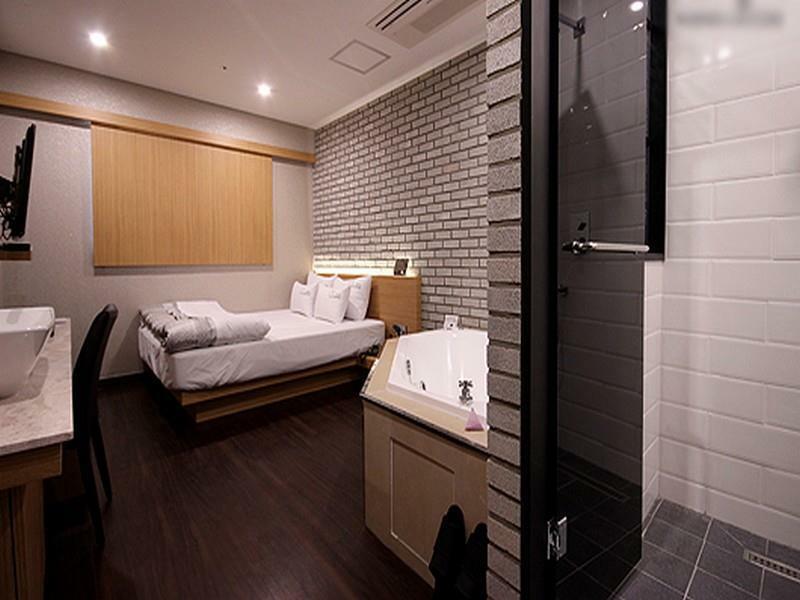 Since this is actually a motel, the bathtub is next to the bed and the basin is also outside the washroom. The hotel is comfortable and the noise isolation was good. Bed was comfortable. The only complain is the pillow that is too springy for me. We were also provided with basic toiletries like Toothbrush and Toothpaste, shampoo, body wash, lotion. Note that not all hotel in Korea provide these even it is 5 star. Their staff is also very helpful and some of them can speak good English. I would recommend this hotel if you are visiting Busan. Excellent. The hotel is right next to the train station and shopping street, so there's plenty of food and ease of transport. Moreover, the cost isn't high and the room is very clean and comfortable. Suitable for married couples. Being right on the main Nampo Dong shopping street, it is very convenient. The room is comfortable and very clean. You pick up and drop off key at a small window like a motel, but the room interior feels like a higher level hotel. The bed was comfortable and nice big shower. No complaints at all with this place except it was difficult to find being on top of floors of shopping buildings.